An unexpected slice of Irish heaven! Anyway, cashed and dieseled up and equipped with the Ordnance Survey map of the district (should have enough detail?) I headed south through Belllanaleck towards Corrigan’s Shore Guest House which looked to be about 15 minutes from Enniskillen. It took a bit longer because the last couple of miles is along a very narrow lane between hedgerows and farm gates. Every time I saw a farmer coming on his huge tractor – or any other vehicle at all really 🙂 I pulled over into the nearest gateway or such, thinking this couldn’t be the way to a popular Guest House! View from one of my windows. Note happy chooks. View from my other window. Note flash Citroen still undamaged. It is though. As I pulled up by the lake, lovely welcoming Catherine threw open the door and made me a pot of tea with scones! I can’t remember the last time I got to spend an afternoon in such a restful place. All I can hear is an occasional moo, a rooster (! ), and a clock ticking. No wonder the guy at the tourist info where I bought the map said he thought this was the best B&B in Fermanagh. Sometimes you can be lucky. I think tomorrow’s plenty soon enough to find Aghavoory townland. We now know a lot about Archibald Beatty, Merchant of Lisnaskea/Ballina/Liverpool (c1836-1897), almost certainly the older brother of our James Beatty of Ballina/South Yarra (1842-1903). Both were born in Fermanagh with father Farmer James Beatty. In an earlier post we established that Archibald had a nephew Joseph Beatty who was keeping an eye on Archibald’s pork/bacon factory in Enniskillen, Fermanagh after his uncle’s death in 1897. 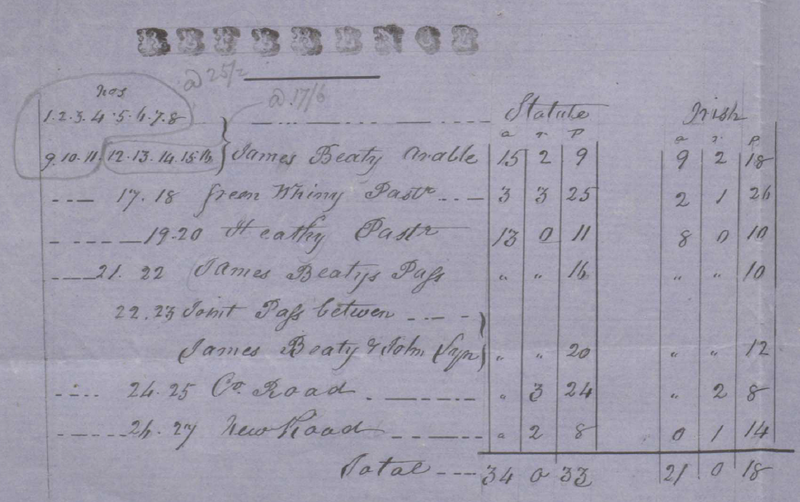 In an attempt to encircle the elusive farmer James, I’ve spent the last few days spreadsheeting every mention of a Joseph Beatty in Fermanagh in the late 19th century that I can find anywhere on the record. Luckily there were fewer Joseph Beattys than James Beattys in Fermanagh at the time and this one was probably alive at the time of the 1901 census (the earliest Irish census to survive intact!). Only one Joseph seemed the right age and to have reason to be in Enniskillen in 1897. He is Joseph Beatty, Egg and Butter Merchant, the son of Joseph Beatty, Farmer of Agheeter townland just south of Fivemiletown. His paternal grandfather is (YES!) James Beatty, Farmer. I tried not to get too excited. 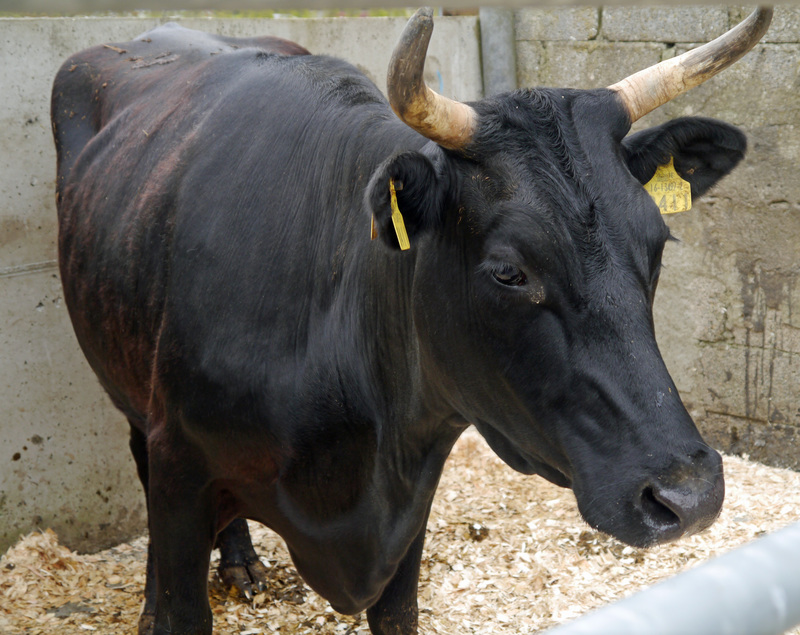 There were over a dozen James Beattys in Fermanagh in the late 19th century, and 90% of them were farmers. To save a lot of time I lashed out on a subscription to RootsIreland.ie -very expensive, but it gives every detail from birth and marriage records including addresses, even names of witnesses at weddings. Joseph Beatty senior married Margaret Mulligan in 1855. His father was James Beatty, Farmer, and his address at the time was not Agheeter, but the nearby townland of Aghavoory. Since at least 1829, Aghavoory, near Fivemiletown had been the address of a farmer James Beatty. Surely Joseph was still living at home at the time of his wedding! A witness at the wedding was Archibald Beatty. Then I found another Beatty whose address at the time of her marriage was also Aghavoory. She was Matilda Beatty (father Farmer James Beatty), married in 1853, again a witness at the wedding was Archibald Beatty. She has to be Joseph’s sister, right? Her husband was William Robinson a farmer at Breandrum townland near Brookeborough, not far from Fivemiletown. Both were still there at the 1901 Census many years later. Furthermore, Edward John Beatty of Liverpool, England, who must have been a well-off young man after the death of his father Archibald in 1897, in 1898 married Martha Eleanor Beatty, daughter of the above Farmer Joseph Beatty of Agheeter, at Brookeborough, Fermanagh. First cousin weddings were pretty common in 19th century Ireland. She went to Liverpool with him where they raised a family. I think the above family tree is proven. Now if only I could prove that Archibald was indeed the older brother of our James Beatty of Ballina/South Yarra. Our James certainly had children named Archibald, Matilda, and Joseph! Hmm… Back to Ballina.